We are offering Siemens DC Drive 6RA80 to our client. 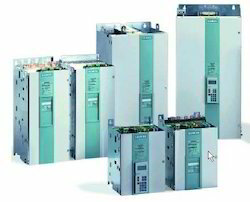 We are supplier of Siemens DC Drive, which we offer to the clients have been quality tested to ensure that they fulfill all the required quality standards which have been set by the industry. These drives are offered to the clients at very nominal rates and they are easily available in the market. Our products give a high performance and hence they are high on demand in the market. We are supplier of Siemens make DC Drive 6RA80, series combines open loop and closed-control and power units in one device and especially sets itself apart as a result of its compact, space-saving design. Our products are made from high quality of raw material and latest technology. Looking for DC Drive ?